October in the Bluegrass means that many of my favorite things have finally arrived; beautiful foliage, tolerable temperatures, tailgates and games for UK football, and my personal favorite, days spent at Keeneland! 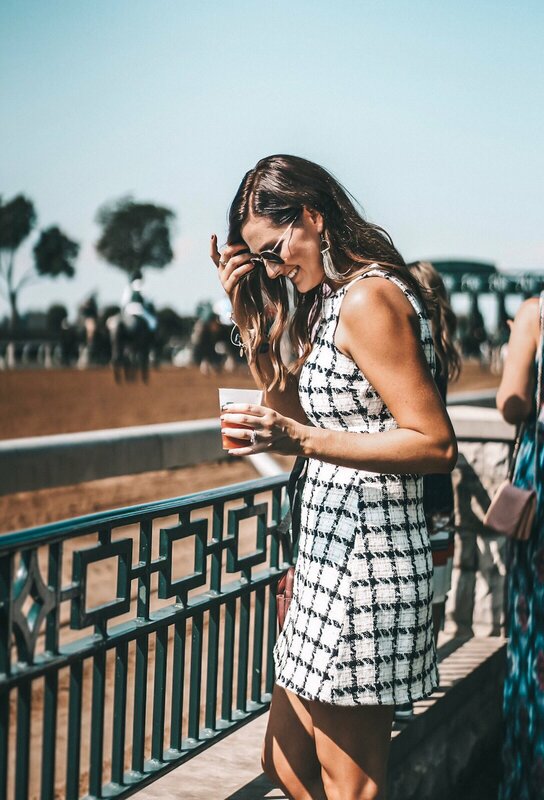 It’s not uncommon to throw on a pretty dress, head to the track, order a Keeneland Breeze, and bet on the ponies here in Lexington once the Fall Meet rolls around. In fact, it’s quite the tradition and the best place to be on the weekends once October rolls around. Justin and I always tell our family and friends to visit us in at this time of year (or April), so they too can experience this fun and beautiful spot in our city. 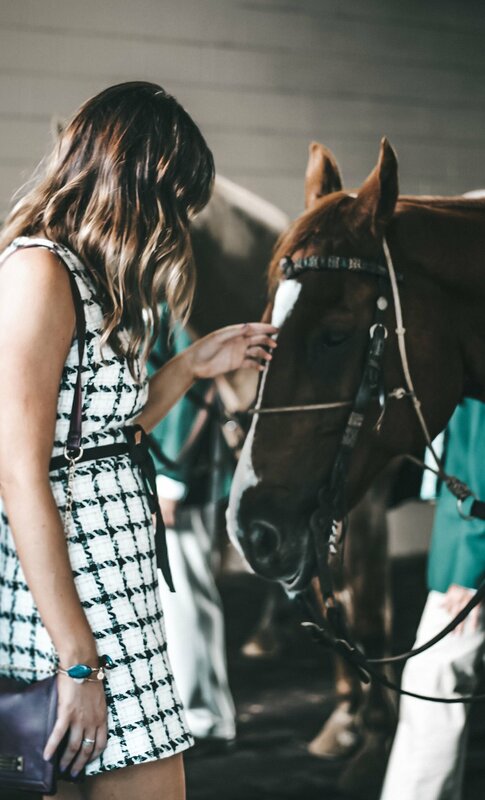 I’m so excited and honored that I was able to partner with Keeneland this season to share my day and experience with you all. So , I want to give a BIG THANK YOU to them for such a fun day! 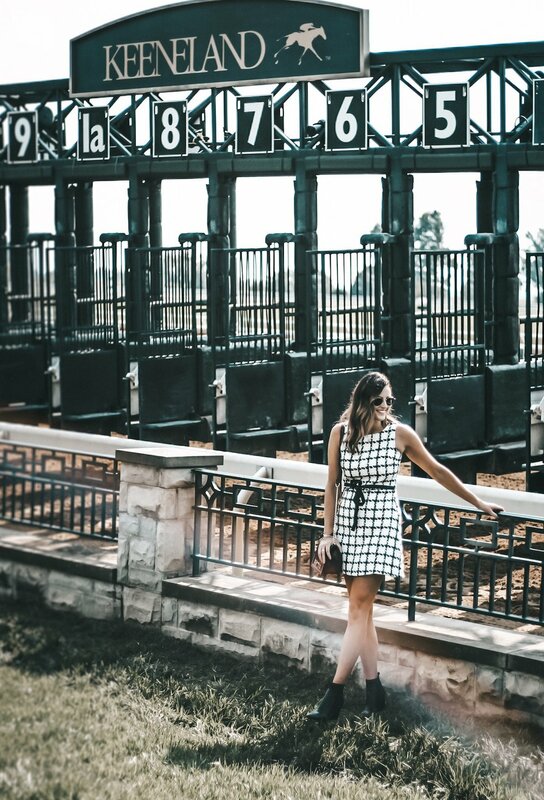 If you’re local to the area, I’m sure you’re well aware of everything Keeneland has to offer :) But if you are not familiar with what Keeneland is, then please stick around! I highly recommend visiting at some point during the Fall and/or Spring Meet seasons! Our Sunday began at Keene Place- a gorgeous mansion on the property that’s full of character and charm. I had never been to Keene Place prior to this brunch, so I was pleasantly surprised by its quaint elegance; its quite the hidden gem found right around the corner from the race track. Upon arrival, the staff was incredibly welcoming and helpful; they made the entire experience enjoyable and relaxing! 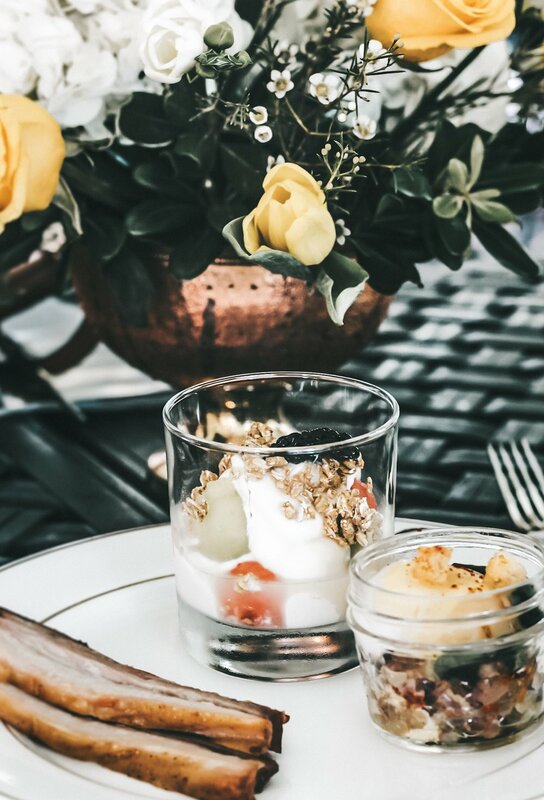 This buffet-style brunch was filled with everything from melon parfaits and pumpkin bread, to smoked cured bacon and house smoked King Salmon dip. The menu was incredible and everything was delicious! The outside seating area also featured a bar that served signature mimosas by Moet; all picture-perfect, of course. Since I don’t drink alcohol, I opted for a glass of orange juice -with the fruit fixings- and it also did not disappoint. Between the beautiful centerpieces and the live guitarist, it was nothing but a picturesque setting and the perfect way to start a Sunday at Keeneland. Unfortunately, tickets for The Keene Place Sunday Brunch are sold out for the remainder of the Fall Meet season. Be on the lookout for more events at Keeneland by visiting their website and/or Instagram page. At this point, it’s usually time to grab that second (or third) Keeneland Breeze or Bloody Mary and start studying the program for the next race. It’s very family-friendly and we look forward to the day we can bring our own little ones to the track :) In the meantime, we’ll continue to enjoy the day with great friends! Going to Keeneland is also a great excuse to get all dolled up. I always try to dress according to the weather, which can be tricky; you never know if it’ll be 85 and sunny (like this particular day), or cold and rainy. I decided on this pretty tweed, sleeveless dress since the summer heat decided to stick around, and because it’s obviously SO pretty. I found it at Morton James, a local boutique here in Lexington. 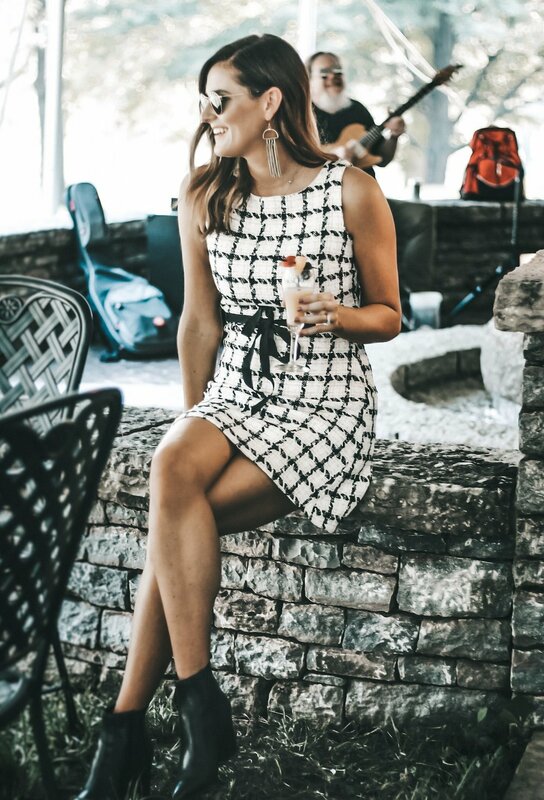 It’s a great summer to fall transition dress, but I also think it would be just as good as a winter option- paired with black tights and a wool coat. Since a full day at Keeneland means you’ll be on your feet for most of the day and lots of walking, I usually opt for a comfortable pair of ankle boots. A block heel is key to making sure you can walk around for hours without deeply regretting it later. I topped off this look with a fun pair of statement earrings and this burgundy purse to add a splash of color to the outfit. 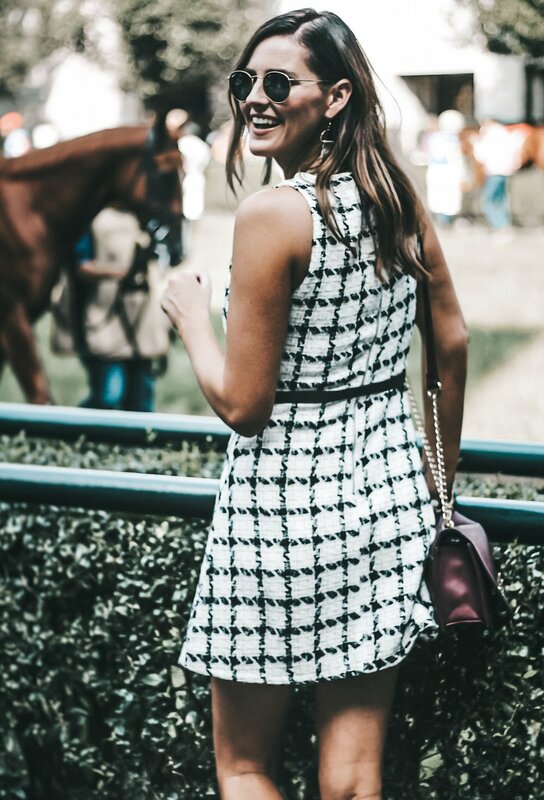 When it comes to Keeneland fashion, I think it’s finding a good mix of classy and comfort, so you’ll be set to enjoy the whole day! I’ve linked a handful of tweed dresses that I love for this season below.